“Outlander” landed three Golden Globe nominations Thursday morning, and the news took executive producer Ronald D. Moore by surprise. Now in the middle of filming Season 2, Starz’s “Outlander” follows the adventures of the time-displaced nurse Claire (Caitriona Balfe), who came from the 1940s and landed in 1700s Scotland, where she met and fell in love with Jamie Fraser (Sam Heughan). They married and then fought for their lives against the evil Black Jack Randall (Tobias Menzies), an ancestor of the husband Claire left behind, Frank. In addition to the show being nominated for Best Series – Drama, Balfe was also nominated for Best Actress and Menzies Best Supporting Actor. Below, Moore talks about how he finally found out his adaptation of the Diana Gabaldon literary sensation was nominated, how he feels about Heughan being left off the Best Actor list, and how Season 2 feels like a totally new show from Season 1. Congratulations on the nominations, how does it feel? Very surprising. I hadn’t really even registered that this was happening today so I wasn’t up early with everyone else. I was asleep and my phone just kept ringing and ringing and I just kept ignoring it. I looked over finally and it was my agent, and I was like, ‘why is he calling me?’ and ignored it again and he called back. Finally I said ‘What? !’ and he said, ‘You got a Golden Globe nomination!’ So I yelled out and my wife, Terry, was in the kitchen, came rushing over and said, ‘What’s the matter, is someone dead?’ And no, it was actually good news. We’ve been fielding a lot of congratulatory calls and emails. Everyone in Scotland found out, they’re very happy. They’re out in a very cold, tough location today, so it was like a shot in the arm for everybody to realize their work is being acknowledged and people are enjoying it. It’s been a really good day. Which Season 1 episodes were you particularly proud of? There were quite a few. The last two were particularly strong, provocative and pushed boundaries. It really gave the whole season an unexpected ending, with some incredible performances from Sam and Tobias. Earlier in the season, I think the wedding episode was very strong .. the Garrison Commander episode was really strong. It was a good year overall. How does it feel to have Caitriona and Tobias nominated too, and are you disappointed that Sam was snubbed? Bummed for Sam. We obviously thought he was in the same caliber as they were. We think of them as the Big 3 on the show. Like I said, he did tremendous work with Tobias in the last couple of episodes and was a big success overall. But it’s a tough field, tough competition. We certainly feel like he earned it as well. Cait is in a class by herself. If you look at Season 1, she was in every scene, every episode, for a long time. She was there from call to wrap over and over again. Audiences had to get comfortable with her, in voiceover she was in your head, you had to watch her continuously, and I think it was an amazing performance. The show literally sat on her shoulders, none of us would be here if Cait wasn’t as good as she is. And Tobias, you think “wow.” Lots of actors have done what he’s done over the years, playing two characters, and he did it better than I’ve ever seen done. He gave both characters dimension and depth, richness and detail. Neither of them are a caricature. Jack Randall is a really complex person, his humanity is always there. These are horrible things he’s doing, but he’s never a cartoon character. And Frank was not just some nice guy, he was complicated and tortured too. You’re in the middle of filming Season 2. How’s that going? How is it different, is it the tone, the look? Is it bigger? It’s bigger and different. Season 1 was primarily in Scotland so it was Scottish castles, stone walls, heavy wood, more of a rustic world. Now we’ve traveled to 18th Century Paris, which was the most populous, most sophisticated city in the world at the time. Claire and Jamie are plotting a conspiracy to stop the Jacobite rebellion, so it’s a more political show, more historical currents of the time, we look at aristocracy, the court of Louis XV, so visually it’s a whole different palette. It’s fattening and gilt and candelabras, just a more rich world. And it’s more French and you’re dealing with historical figures for the first time. There’s speculation that it doesn’t follow the book, “Dragonfly in Amber,” quite as closely as the first season did. Yeah, it took more work to adapt it. It’s a more complicated plotline. Diana shifted points of views a couple of times, it’s more politicals, it deals with a lot more elements, it shifts locations more than once. It’s just a more complicated piece of material to try and adapt. Whereas the first season, it was relatively more straightforward, more linear and you can just track it moving forward. Season 2 just required more work. It was a harder book to adapt and as a result, we did make more changes from the source material than we probably did in Season 1, but it’s definitely that world. It’s definitely that story. Anyone who’s read the book will definitely recognize it. I have to ask if you’ve cast Jamie and Claire’s daughter, Brianna, or her love interest, Roger yet. We have not cast anyone yet, but we are very close. We are closing in on it. 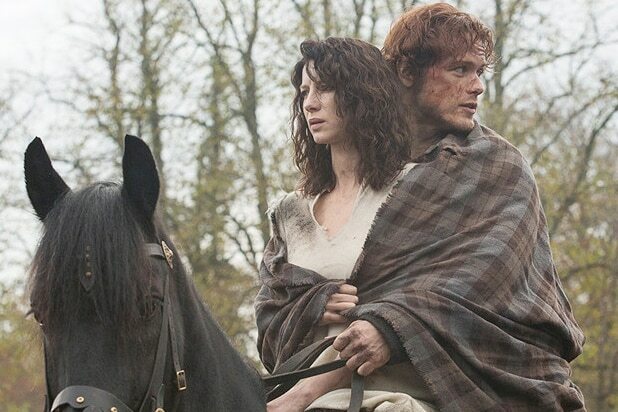 “Outlander” returns for Season 2 in April 2016 on Starz.